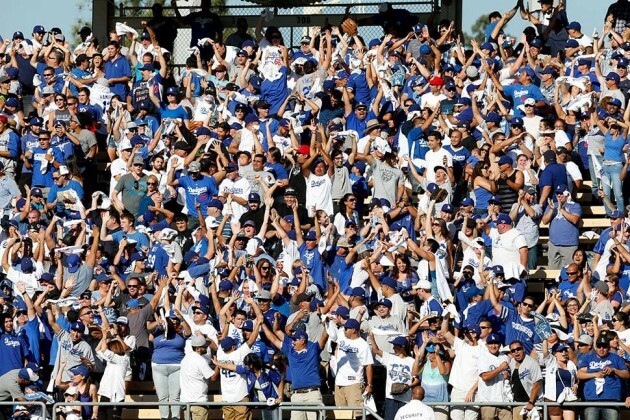 Next time you go to the ballpark, look at the fans around you. Who do you see? There’s the family of four in front of you, where you can clearly see which of the parents is the baseball fan and which one would rather be watching Gilmore Girls on Netflix. There’s the youth group taking a field trip to the baseball park. You’ll even see the naturals, the hardened baseball viewers who are following every bit of action on the field. But you know who you won’t see? The fan with the scorecard in their lap, tracking every pitch with pencil marks on their sheets. Those fans are a dying breed in major league ballparks, found more among scouts and media boxes than patrons in the bleacher seats. And you know what? That’s a shame. 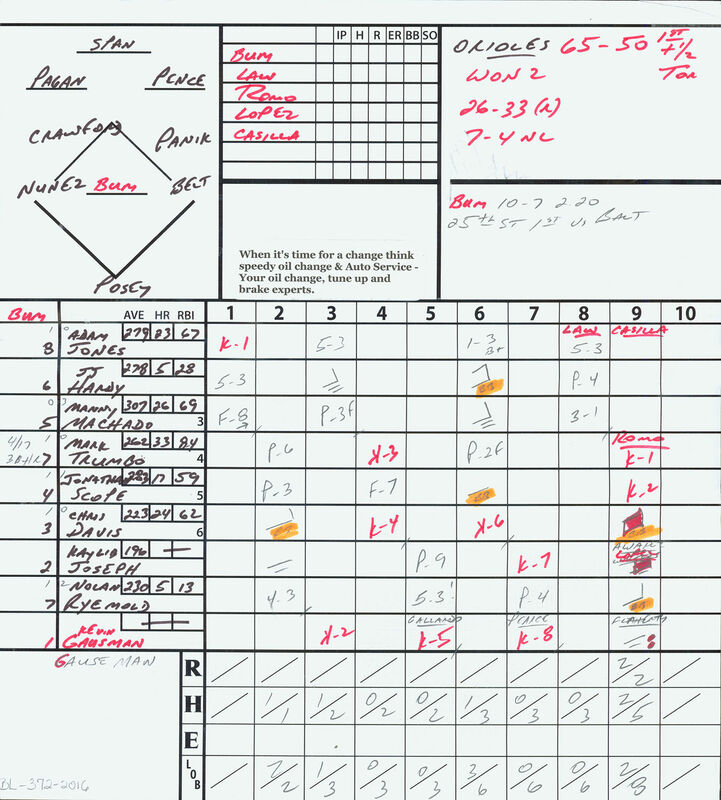 Scorecard of a game between the Baltimore Orioles and the San Francisco Giants, August 13, 2016; kept by Duane Kuiper, found at baseballhall.org. I didn’t always score games. It’s something I picked up and began doing once I became a die-hard baseball fan. But once I started scoring games, I noticed something. I was hung on every pitch, every moment on the field. I couldn’t miss a moment – missing a moment meant I couldn’t have a complete scorecard. And to an OCD baseball fan like me, those things matter. A scorecard is also the cheapest and most genuine souvenir you can get at a baseball game (though I’m sure Brett will disagree with me on this one). I save the scorecards from every game I’ve been to. Looking back at them instantly recalls memories of the game. I can remember watching Ben Revere break the Nationals’ franchise record for stolen bases in a single game. I have scorecards from Yoan Moncada’s time in Double-A Portland before he was traded to the White Sox. I have written proof of Bradley Zimmer’s MLB debut with the Cleveland Indians (though he finished 0-3 with 3 strikeouts). The scorecard encapsulates the memories of the game, not just the game itself. There’s a timelessness to scoring the game as well. At Wooster I was part of a team that extensively researched the school’s history, including their baseball team. In the archives I found a complete scorecard from a 1907 game between Wooster and Kenyon. I wasn’t at the game, of course, but when I see on the scorecard the 6-4-3 double play to end the inning, my imagination fills in the blanks and I can see the game come to life. I’m not going to tell you that you have to bring a scorecard when you go the ballpark, and I’m not going to make fun of you if you don’t know how. Baseball is America’s greatest democratic tradition – each of us watches the game and cherishes it in our own way. If you prefer to have a beer and socialize, that’s wonderful, and have fun doing it. But me? I’ll have my scorecard in my lap and my pencil in hand, waiting with baited breath on each and every pitch. Feel free to try it sometime.